The Hotel L’Orologio is a delightful place in which to stay, for it is very comfortable, immaculately maintained, offers pleasant and efficient service and enjoys a desirable location in one of the finest squares in Florence. But if you love your expensive wrist watches... then it is Heaven itself. 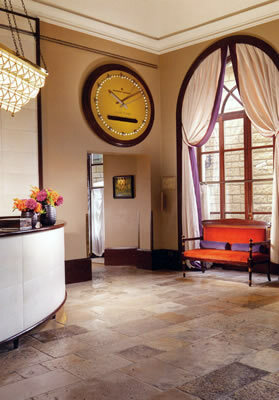 The owner of the hotel is fascinated by such timepieces, and has an extensive horde of the best examples. His enthusiasm is reflected in the work of interior designer Marianna Gagliardi throughout the hotel – in photographs, paintings and numerous small details. Each floor of the building has as its theme one of three famous manufacturers – Rolex, Vacheron Constantin and Patek Philippe – and each room has above its door the name of one of the items in the owner’s collection. I noticed that even the door handles in the bar were in the form of the hands on a watch face. Truly, this establishment reflects its owner’s passion. 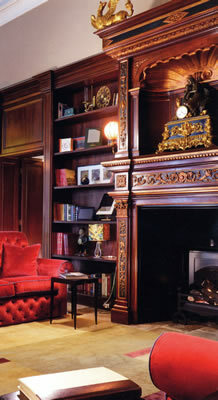 In one of the grand sitting rooms – and they are quite grand, some of the grandest I have encountered in a four-star hotel – I found a large and attractive safe. Its purpose? To store the valued wrist watches of hotel guests. I was told that it even contained a mechanism for rocking such items to and fro, so that watches with automatic mechanisms could be kept fully wound. Such attention to detail is exactly what I like to find in hoteliers. The charming hotel managers – Silvia Battini and Alessio Nuzzi – pointed out to me these details, of which they are rightly proud. They themselves are to be congratulated on their staff. Every member of it I encountered appeared to be well motivated and pleasant of disposition. I should give a special mention to the waiters at breakfast, who went out of their way to ensure that my needs were supplied. The managers explained to me that the meticulous renovation of the building had taken several years, not least because ancient columns had been discovered in the structure. These had required the attention of experts in historical matters. The piazza Santa Maria Novella is an important part of Florence, and it is essential that everything done here must be exactly right. And it has been. I looked at several of the 58 rooms at L’Orologio. All were smart and comfortable. But I would suggest the readers of Bown’s Best might want to opt for one of the three suites. Two are duplexes (which do not suit my aversion to stairs), so I was in the third, room 501 on the fifth floor. This suite costs from 320€ to 520€ a night, bed and breakfast for two, according to season. And here we have another feature of L’Orologio: good value. The prices for double rooms begin at 195€-375€, according to season, and – for such pleasant air-conditioned accommodation in such an excellent location in Florence – they must be regarded as something of a bargain. The name of my apartment was ‘1518 Acciaio’. If you are a timepiece aficianado, this will set your pulse racing, for it is the designation of a very rare ‘perpetual calendar’ Patek Philippe, an example of which in 2016 at an auction in Geneva – at a little over eleven million dollars – became the most expensive wrist watch in the world. With such a name above its door, the suite had to be both comfortable and elegant. I am pleased to report it was both. I like dark mahogany, and its abundance was much to my liking. The sitting room was long and narrow, with armchairs in brown leather, a good sofa, a decent writing desk and pictures of (what else?) Patek Philippe watches. But its glory was outside. Through a glass door was a spacious terrace, with a table and four chairs, and from the terrace was the Florentine View of views – over the rooftops to the Duomo. It was such a treat to be able to sit in the afternoons with a pot of tea beside me and with the sound of birdsong all around, and gaze at the marble masterpiece in the distance. Does the sun always shine on the cathedral’s West front and on its separate bell tower? Probably not. But it shone for me, and my spirits soared. 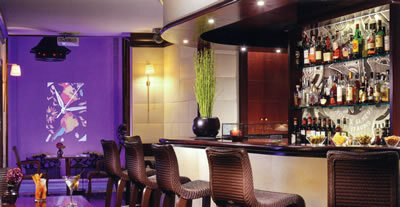 The hotel does not have a restaurant, although snacks can be had in the bar on the ground floor. But be careful not to walk into the pretty pool after your morning glass of chardonnay: it is intended to be entirely ornamental. 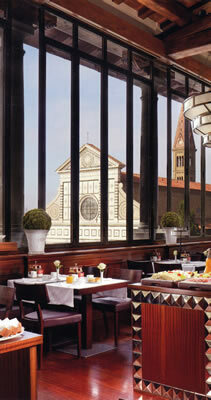 Breakfast is served on the fourth floor, in a chamber which offers views of the famous church of Santa Maria Novella, the façade of which must surely be one of the most harmonious in Christendom. Here I tucked into excellent scrambled egg and bacon from the buffet, along with fresh fruit salad, cakes, cheeses, hams and Kellog’s Allbran. (The last was made more than usually good by the addition of fresh strawberries.) This breakfast room is not large, and can be busy when the hotel is full, but I found that the waiters – praised earlier – worked impressively hard to ensure that all ran smoothly. I enjoyed these beginnings to my days. 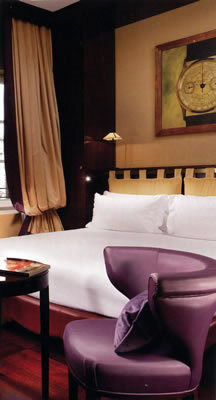 Indeed, I enjoyed everything about my stay at L’Orologio. Smart, well-run and conveniently located, it is a real ‘find’ among the hotels of Florence. And if you love wrist watches, your cup will runneth over. Piazza Santa Maria Novella 24, 50123 Florence, Italy.